A native of Elgin, TX and a 1997 graduate of Elgin High School, Captain Joshua Meadows enlisted in the Marine Reserves in 1996 while still in high school. Capt. Meadows loved baseball, was an Eagle Scout, earned his private pilot’s license at age 16 and was president of his Pi Kappa Alpha fraternity. While serving a tour in a reserve unit in Austin, TX as a Machine Gunner, he studied at Texas Tech University, graduated with a degree in business, and was commissioned a Second Lieutenant in the Marine Corps in December 2001. Capt. Meadows attended flight school in Pensacola and Corpus Christi, TX and became a naval aviator in March 2004. 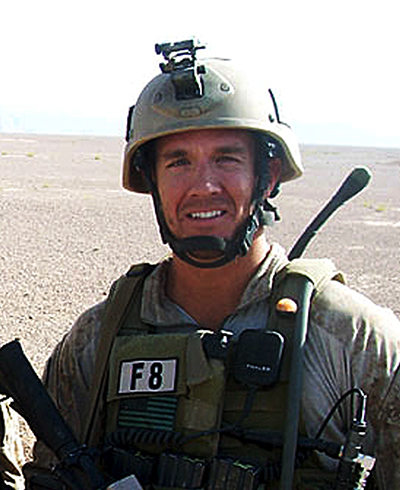 He joined MARSOC in May 2009. While on a deployment to Farah Province, Afghanistan with 1st MSOB, Capt. Meadows was killed on a combat mission while supporting Operation Enduring Freedom. He died while his wife, Angela, was carrying their first child. Capt. Meadows’ personal decorations include a Bronze Star with combat V, Purple Heart, Navy-Marine Corps Commendation Medal, Navy-Marine Corps Achievement Medal and Combat Action Ribbon.